Windows has no idea what to do with that mountain of APK files you've probably downloaded from APK Mirror, which can make managing said mountain of files annoying. Apkshellext2 is a Windows shell extension that might make your life much easier, as it has mine. Just a few clicks and Windows Explorer will get much smarter. Installing Apkshellext2 is mostly painless. Just download and unzip the installation package from the website to get started. This is a shell extension, so you'll need to run the batch file as administrator. Failing to do so causes the command prompt to go a little wonky. After the scripts have been run, you might have to restart Explorer (there's a batch file for that), but I didn't need to do that on Windows 10. Right away you'll notice that you can see app icons in Windows, which is fantastic. Just that makes managing files much easier. 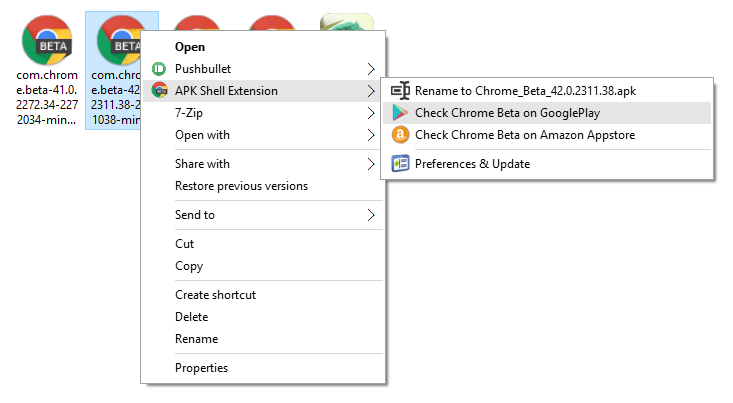 To access the Apkshellext2 tools, right click on an APK and open the APK Shell Extension menu item. From here you can automatically rename files (even more than one if you select multiple APKs) with the app name and version number. The menu also has links to the Play Store and Amazon store, which it pieces together from the package name. If the app isn't listed in the Amazon Appstore, your browser will just load the main Appstore page. The Google Play link is really useful, though. 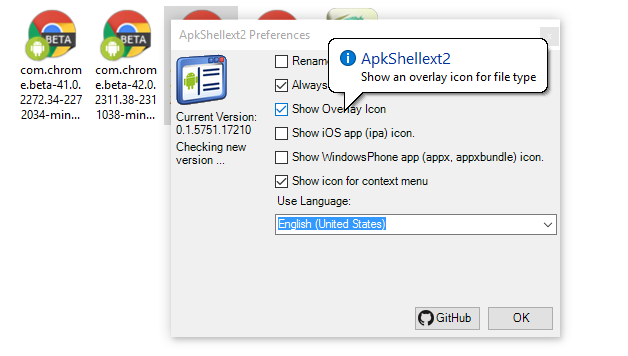 Apkshellext2 works for iOS and Windows Phone app packages too, but that's rather outside our area of interest. If you do have apps from multiple ecosystems, you can turn on an overlay icon in the settings that displays a platform logo on each app. Apkshellext2 is a free and open source product, which you can find on GitHub. It's been in development for a while, despite the newer GitHub listing—it moved over from Google Code. You should check it out, and if you're the programmer type, maybe contribute to the project.